Rick Savage, bass player with Def Leppard was Born 2nd December 1960. Formed in 1977 in Sheffield as part of the New Wave of British Heavy Metal movement. Def Leppard ’s strongest commercial success came between the early 1980s and the early 1990s. Their 1981 album High ‘n’ Dry was produced by Robert John “Mutt” Lange, who helped them begin to define their style, and the album’s stand out track “Bringin’ On the Heartbreak” became one of the first metal videos played on MTV in 1982. The band’s next studio album Pyromania in 1983, with the singles Photograph and Rock of Ages, turned Def Leppard into a household name. In 2004, the album ranked number 384 on Rolling Stone’s 500 Greatest Albums of All Time. 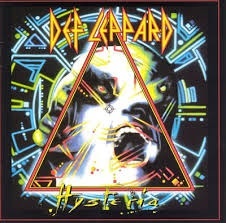 Def Leppard’s fourth album Hysteria, released in 1987, topped the U.S a nd UK album charts. As of 2009 it has 12x platinum sales in the United States, and has gone on to sell over 20 million copies worldwide. The album contained loads of great songs, including the U.S. Billboard Hot 100 number one “Love Bites”, alongside Pour Some Sugar on Me , “Hysteria”, Armageddon It , “Animal” Rocket“, Gods of War and Women. Their next studio album Adrenalize reached number one on the U.S. Billboard 200 and UK Album Chart in 1992, and contained several hits including, “Let’s Get Rocked” and “Have You Ever Needed Someone So Bad”. Their 1993 album Retro Active contained the acoustic hit song “Two Steps Behind”, while their greatest hits album Vault released in 1995 featured track “When Love & Hate Collide. Def Leppard’s latest album “Def Leppard” was released in 2015 together with a Magazine and Keyring as a limited edition Fanpack and contains sixteen tracks. On June 14, 2005 Foo Fighters released their fifth album In Your Honor Featuring collaborations with John Paul Jones of Led Zeppelin, Josh Homme of Queens of the Stone Age and Norah Jones. the album was a departure from previous efforts, and included one rock and one acoustic disc. Foo Fighters’s sixth studio album Echoes, Silence, Patience & Grace was released on September 25, 2007. and spawned three singles “The Pretender”, “Long Road to Ruin” and “Let It Die”. In 2009 Foo Fighters released their Greatest Hits collection, consisting of 16 tracks including a previously unreleased acoustic version of “Everlong” and two new tracks “Wheels” and “Word Forward” which were produced by Nevermind’s producer Butch Vig. The Foo Fighters’ next released the album Wasting Light, which was released Spring 2011, and included the single “Walk”. The Foo Fighters album Sonic Highways was released in Autumn 2014 and features songs inspired by some of the cities the Foo Fighters have visited while on tour. They also released an EP in December 2015 Entitled St. Cecilia to mark the end of their world Tour.